A roaster oven is a versatile cooking appliance that allows you to roast, bake, steam and slow cook, replacing many of the appliances in your kitchen. 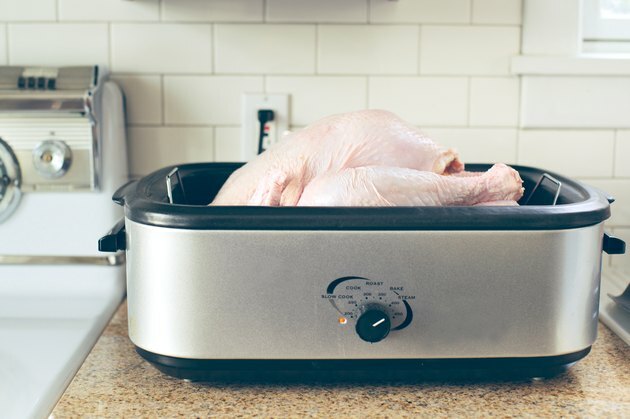 Cooking a turkey in a 16-quart roaster oven uses less energy than your kitchen oven, and because of its compact size, allows you to cook a turkey in less time than your conventional oven. A 16-quart roaster requires eight minutes per pound, whereas a conventional over requires 12-to-15 minutes per pound. Remove the turkey neck and giblet bag from the body of a thawed turkey. Rinse the turkey well inside and out. Dry the turkey with paper towels. Prepare the turkey for cooking in the 16-qt. roaster oven by either brining, seasoning with a rub or with an injectable marinade. Brining uses a base of salt and water to pull the blood from the turkey and adds moisture. To season the turkey with a rub, you will pat the turkey inside and out with seasonings, such as parsley, rosemary, rubbed sage, lemon pepper and salt, or use pre-made rubs, such as Texas smoked rub, cajun or tropical Caribbean to enhance the turkey's flavor. Marinades that inject directly into the turkey, such as creole butter or roasted garlic and herbs, add flavor quickly, without the need to marinate in the refrigerator overnight. Remove the cooking rack from the roaster oven and place the turkey on the rack. Set the roaster on a heat-safe surface or place it on top of bath towels. Preheat the 16-qt. roaster oven to 400 degrees Fahrenheit for 20 minutes. Melt butter in a small microwave-safe bowl and stir in browning sauce. Use 2 tbsp. of browning sauce for every 1/4 cup of melted butter. Brush the butter and browning sauce over the exterior of the turkey with a basting brush. Spray the inside of the roaster with nonstick cooking spray. Set the rack and turkey inside the roaster. Place the cover on the roaster and cook for 30 minutes. Reduce the temperature on the roaster to 350 degrees Fahrenheit. 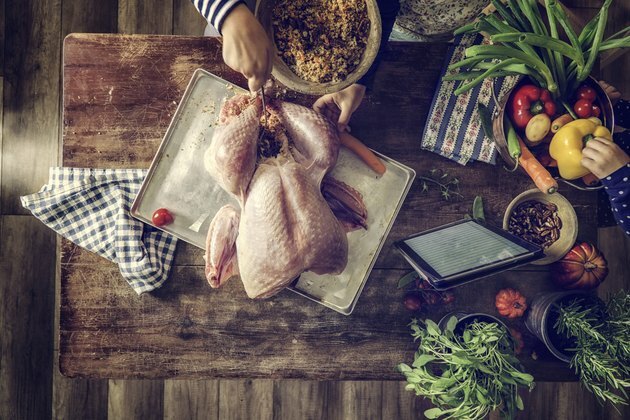 Continue to cook the turkey for a total of 8 minutes per lb., including the 30 minutes at the higher temperature, or until a meat thermometer inserted into the turkey's thigh reaches 180 degrees Fahrenheit. For example, a 22 1/2-lb. turkey requires a total cooking time of 3 hours. Spices Inc: Is Turkey Brining the Best Way to Season Your Bird?